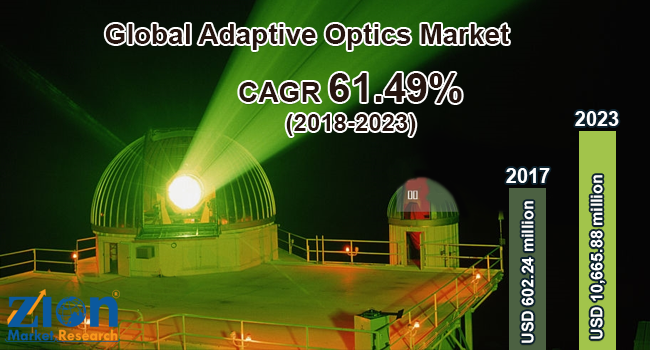 With the presence of a large pool of participants, the global adaptive optics (AO) market is displaying a highly competitive business landscape, finds a new research report by Zion Market Research (ZMR). Northrop Grumman Corporation, Adaptive Eyecare, Benchmark Electronics, Boston Micromachines, Phasics Corporation, Adaptica SRL, Baker Adaptive Optics, Aplegen, IRIS AO, EOS Technologies, EOS Technologies, and Holoeye Photonicsare are some of the key vendors of adaptive optics across the world. These players are focusing aggressively on innovation, as well as on including advanced technologies in their existing products. Over the coming years, they are also expected to take up partnerships and mergers and acquisitions as their key strategy for business development, states the adaptive optics (AO) market study. Citing an instance, in October 2018, the National Science Foundation has awarded grant to W. M. Keck Observatory for building next-gen adaptive optics system through its mid-scale innovations program. As estimated in this report, the global adaptive optics (AO) market stood at US$ 602.24 million in 2017. Witnessing a tremendous rise during the period from 2018 to 2023, the revenue in this adaptive optics (AO) market is expected to reach US$ 10,665.88 million by the end of the forecast period. The main types available in this adaptive optics (AO) market are Next Generation Adaptive Optics (NGAO), Ground Layer Adaptive Optics (GLAO), Multi-Conjugate Adaptive Optics (MCAO) and Multi Object Adaptive Optics (MOAO). The main components available in this adaptive optics (AO) market are wavefront sensor, wavefront modulator, and control system. Among them, the demand for wavefront sensor is relatively higher and the trend is anticipated to remain so over the next few years, notes the research report. “Massive demand for adaptive optics in high-resolution microscopy along with growing value for utilizing adaptive optics in free-space laser communications and use of adaptive optics for long-range identification in military applications are the key growth drivers of adaptive optics (AO) market,” says the author of this study. Apart from this, rampant use of adaptive optics in ophthalmology and retinal imaging is expected to support the growth of adaptive optics (AO) market in the years ahead. In addition, large-scale acceptance of adaptive driver-assistance systems in vehicles along with rise in the amount of funding by the government is expected to further impel the growth of adaptive optics (AO) market in the years to come. High initial costs and complicated designing techniques, however, are expected to pose a threat to the growth of adaptive optics (AO) market. Nevertheless, advancing adaptive optics technology along with development in professional astronomy are anticipated to open new growth horizons for adaptive optics (AO) market in the years ahead. Regionally, North America has been leading the worldwide adaptive optics (AO) market and is anticipated to continue on the dominant position in the years to come, states the adaptive optics (AO) market study. Rise in the number of laser eye surgeries along with extensive use of adaptive optics in defense and security are the key factors behind the dominance of the North America adaptive optics (AO) market. The high number of market players being headquartered in North America is another significant factor that is supporting the growth of this regional adaptive optics (AO) market.